"Bivouac - An encampment under little or no shelter used for a short time." 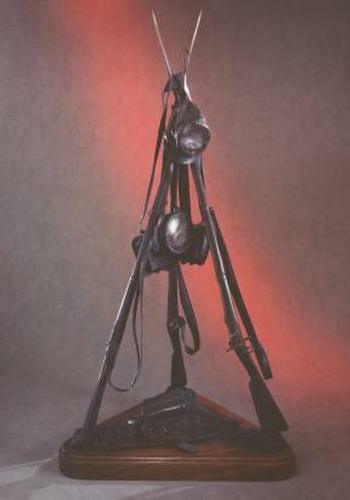 Three confederate "CS Richmond" rifle-muskets are "stacked" together by interlocking the fixed bayonets. One, without a bayonet, is using the extended ramrod in its place. These .58 cal. rifle-muskets, stamped "CS Richmond, Va" on the lock plates were manufactured at the Richmond Armory, where the headquarters of the Confederate Ordnance Dept., commanded by Col. J. Gorgas, was also located. Originally known as the Virginia Armory, it was taken over by the Confederate Government on August 23, 1861. The machinery at the armory was captured at Harper's Ferry. The production records from July 1861 to January 1865 showed that the Arsenal issued 323,231 infantry arms and 34,076 cavalry arms which includes production from other private arms manufacturers in the area as well as repaired and captured arms. The cartridge boxes hanging from the bayonets are the standard Federal .58 cal. box or Confederate copies. One has the rare "CS" oval box plate while the other has only the impression left by possibly a "US" plate which was removed. The box on the ground is a Confederate make and stamped "Houston Ordnance Dept., Capt. H.T. Scott" (Inspector) Texas 1864" and is designed to be worn on a belt instead of a shoulder strap. The wood drum canteen was a style issued to some troops due to a shortage of metal for tin canteens in the South. The rectangular belt plate, made of alloy copper, was one of many types of Confederate issue. The musket-cap box is a CS copy made at the "CS Arsenal, Baton Rouge, La" and is so stamped on the front. The homemade cap is a variety of the many non-standard items of Confederate apparel. All are ready to be taken up in a moment's notice at the first command, drum roll or cannon shot to be brought to bear once more in the defense of the Southland.